Have any of you seen the movie Waitress? I just love it to pieces. This is my I Don't Understand Turbulent Convection in Stellar Interiors Raspberry Pie. 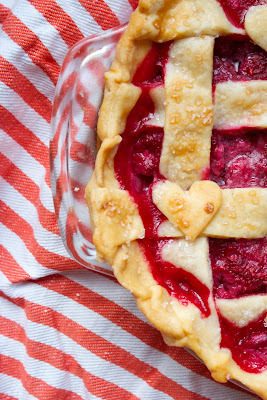 This pie is just some good, old-fashioned, home-cooked love. 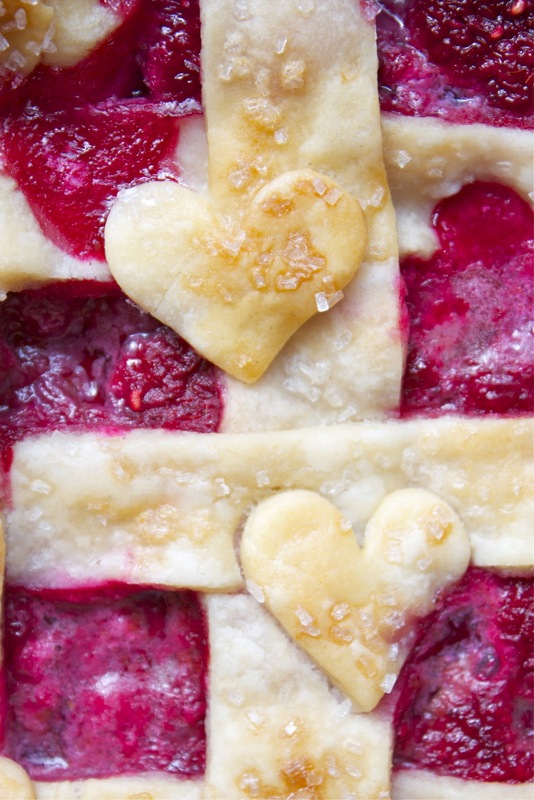 Flaky crust, tart and sweet filling, and a lot of heart(s). I do not have any pictures of pie wedges, because this dessert was devoured by grad students in about three minutes flat. That does suggest, however, that this pie recipe is a keeper. Personally, I don't like to add too much cornstarch or flour to my filling. I like a slightly thickened filling, but I don't want to taste paste, so I just sprinkle some cornstarch on the top. Any kind of berry or cherry can be substituted for the raspberries. 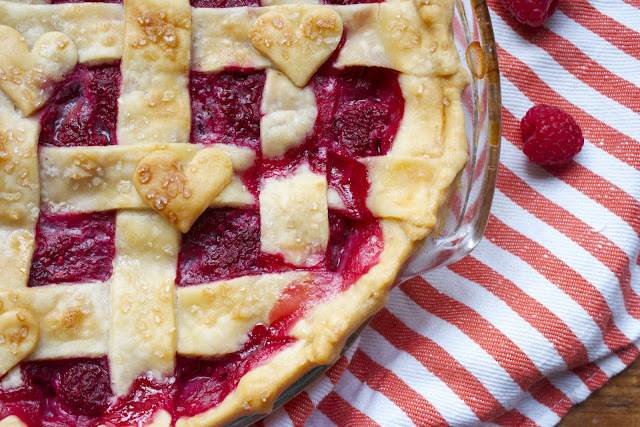 Nothing beats fresh raspberries, but frozen ones will work just as well (I would make sure to thaw the frozen raspberries and drain the excess water so that your pie isn't soupy.). The fruit will joyfully bubble and the crust will golden, letting you know that it's ready to come out of the oven. The taste is perfect, but what will truly win you over is the aroma. This is the kind of pie that makes your whole house smell inviting and promises a comfortable haven. If there is one slice of advice I can give you, it's this: Take some time to smell the pie. For the crust: In a food processors, pulse the butter, flour, and salt until it resembles a coarse meal. With the processor on, slowly add the ice water until the dough begins to hold together. Press the dough into a rough ball, then transfer to a lightly floured surface. Knead the dough a few times until smooth. Divide dough into 2 balls, one slightly larger than the other, and flatten each slightly to make a flat disk. Wrap disks individually in plastic wrap and refrigerate for 1 hour. For the filling: Toss raspberries with lemon juice, sugar, and cinnamon in a bowl. Set aside. For the pie: Preheat oven to 375°. Roll the larger disk of dough out on a lightly floured surface into an 11" round, then fit it into a 9" glass pie plate. Transfer filling to pastry bottom. Sprinkle with 1 teaspoon of cornstarch and scatter the 3 tablespoons of butter over fruit. Roll the remaining disk of dough out on the lightly floured surface into a 10" round, then cut it into eight 1"-wide strips. Weave dough strips on top of filling to make a lattice-top crust, fold edges of dough under, and crimp edges. 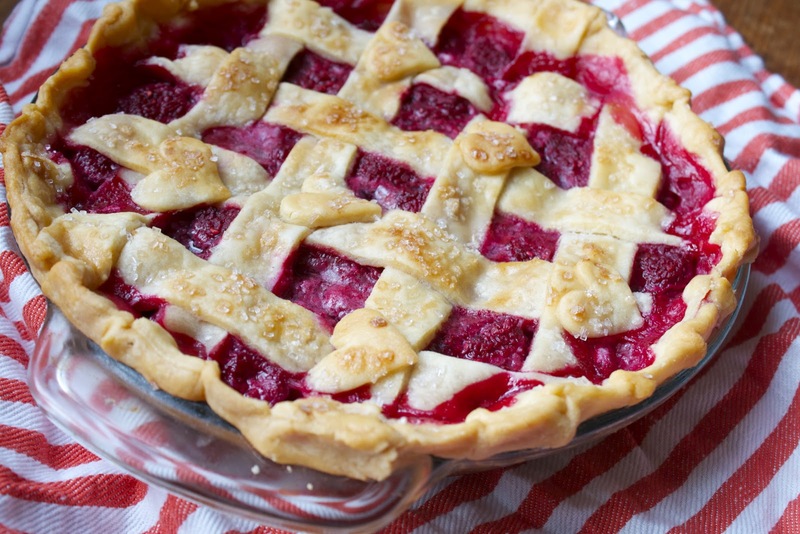 Brush lattice crust with 1 teaspoon of milk or cream and sprinkle with coarse sugar. Bake until pastry is deep golden (cover edges of crust with foil if browning too quickly), 60–70 minutes. Set pie aside to cool for several hours before serving. I thought that movie was great, I've watched it twice. :) The pie looks fantastic. My absolute favorite thing. 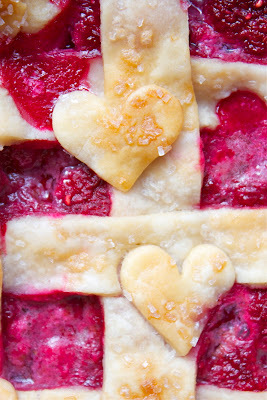 Raspberry pie, I will definitely try your recipe, can never try enough pie recipes! Thanks for this! Stunning pie and I absolutely LOVE that movie! This pie is gorgeous!!! I also made a raspberry crumble recently. Your details are adorable! Nice to see a pie, I don't see many in the blogiverse for some reason. And your recipe gives a pie great credit, beautiful! I loved that movie Waitress and this pie is adorable. I can't get over the little heart details, fabulous! Your blog and recipes are great. Want a piece! What a great post! 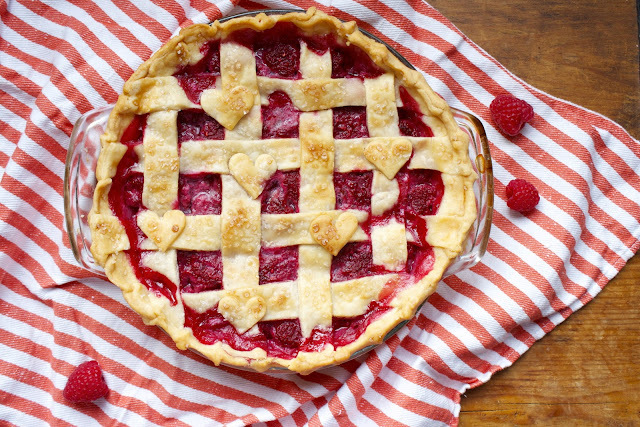 This is a super fabulous pie and it looks beautiful. Check us out sometime @ BloomEveryday.wordpress.com. :) Would love for you to check out some of our recipes. mmmmmmmmmmm...gorgeous blog! It's way past my bedtime and I'm now starving! OH MAN, PIE. :) This will definitely be happening now!